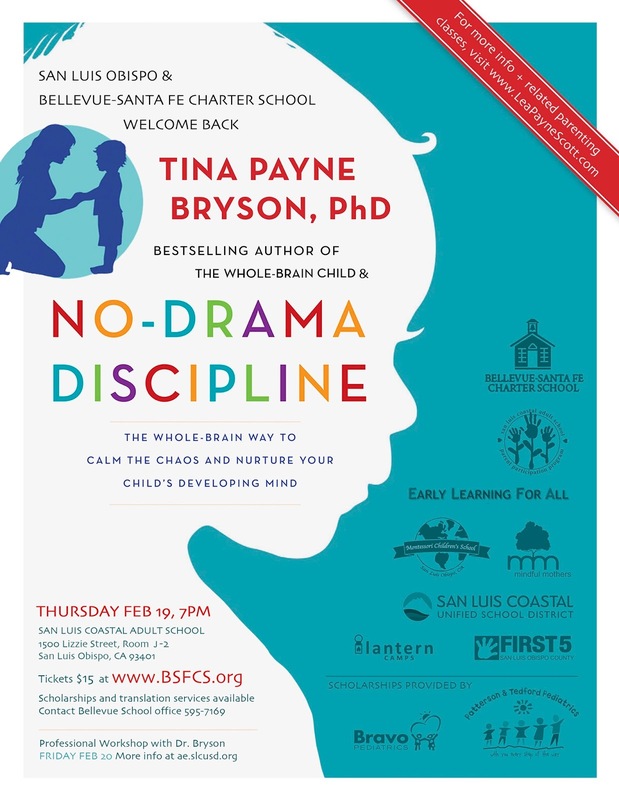 Mindful Mothers together with the Bellevue Santa Fe Charter School, welcomes back Dr. Tina Payne Bryson, bestselling author of The Whole Brain Child and No-Drama Discipline! San Luis Coastal Adult School, Room J2. Buy your tickets now and mark your calendars. Space is limited! Thank you to all of the sponsors for making this event possible. For information, Contact the Bellevue School office at (805) 595-7169. The pioneering experts behind The Whole-Brain Child - Tina Payne Bryson and Daniel J. Siegel - now explore the ultimate child-raising challenge: discipline. Highlighting the fascinating link between a child’s neurological development and the way a parent reacts to misbehavior, No-Drama Discipline provides an effective, compassionate road map for dealing with tantrums, tensions, and tears—without causing a scene. Defining the true meaning of the “d” word (to instruct, not to shout or reprimand), the authors explain how to reach your child, redirect emotions, and turn a meltdown into an opportunity for growth. By doing so, the cycle of negative behavior and punishment is essentially brought to a halt, as problem solving becomes a win/win situation. Tina is an expert at helping parents demystify the meltdowns and aggravation children face by explaining the new science of how a child's brain is wired and how it matures. She has as unusual knack for taking research and theory from various fields of science and offering it in a way that's clear, humorous and immediately helpful.